In Waimanalo, flood clean-up comes with a question: Could this have been prevented? WAIMANALO, OAHU (HawaiiNewsNow) - Peter Kekahuna has lived in Waimanalo most of his life. He's never seen the community take a walloping quite like the one it got Friday night, when floodwaters rushed through homes and stranded cars on roadways from Aina Haina to Kailua. "It was pretty bad," he said. "Water was just flowing over the cars." Rushing water topped the banks of a canal that runs along Mekia Street, and floodwaters sent cars and debris rushing toward homes. Some residents in the area believe the damage could have been avoided if there was adequate drainage in the neighborhood. They're hoping something will be done before the next big storm. "There's nowhere for the water to go. We have one drainage halfway down the road and that's it. 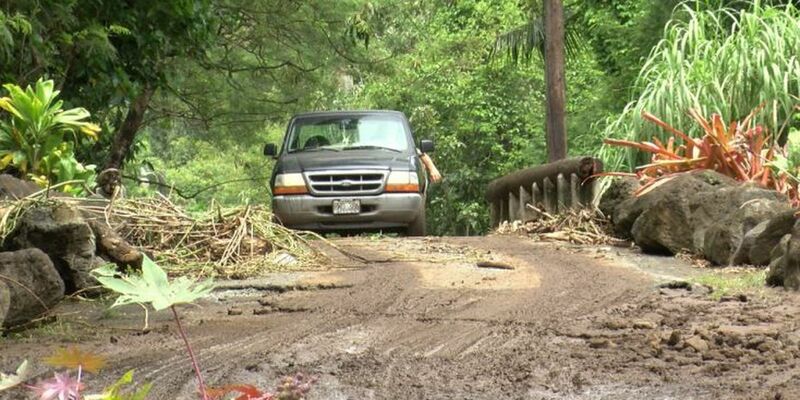 We don't have any more on this road," Kekahuna said. On Saturday, residents across Waimanalo came out to start the big job of cleaning up the storm's mess. "Everybody was out here cleaning. I mean rubbish cans. We had dead chickens, you name it." said Kekahuna. "If the city or the state or whoever can come out and reassess the situation, it would be beautiful because even on minor days when it's not as heavy flooding, we've still got the same problem," he added. Click here for more weather-related photos.